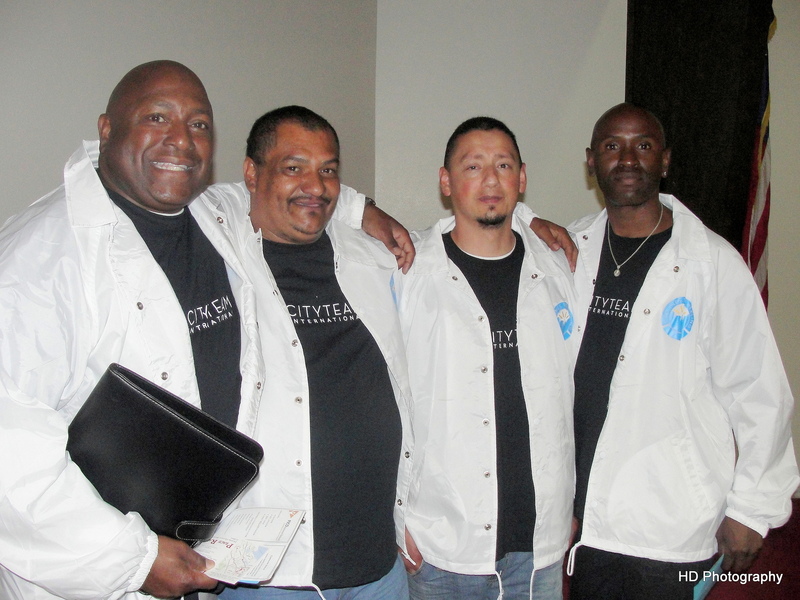 Members of City Team participated in the Lifelines program at Allen Temple. They have since started their Friday Night Walks. Photo: Howard Dyckoff, Oakland Voices 2012. Oaklanders are marching to demand an end to gun violence. There have been youth rallies, peace marches and on-going night walks in the most violence-plagued areas of East Oakland. Many of these events are headed by church groups and community organizations banding together with the City to re-launch the Cease Fire program that Oakland first attempted 3 years ago. City leaders plan to kickoff the new program with its community partners before the end of this month. The Mayor’s Office and Oakland Police are working closely with several of these organizations to implement Cease Fire in several neighborhoods. One of those is the national, faith-based group Pacific Institute for Community Organizations (PICO). Even though Oakland has gone for the last 3 years without an official Cease Fire plan in place, Oakland’s PICO office has developed its own programs inspired by Boston’s successful Cease Fire strategy. The group has also coordinated with the recent Peace March from both East and West Oakland to City Hall that was planned by Soldiers Against Violence Everywhere, a faith-based group in Oakland. Oakland’s Lifelines is a new project. Mayor Jean Quan and activist Rev. J. Alfred Smith, Jr. announced the project last month at Allen Temple. But many residents who attended were hopeful for its success, including Marilyn Lawson. She works with youth in East Oakland and has been involved with the family of Hadari Askari – a 15-year old shot to death in Oakland in July. Police Chief Howard Jordan joined in announcing PICO’s Oakland Lifelines to Healing project at Allen Temple Baptist Church in mid-September. Over 100 Oaklander’s attended the community meeting which outlined the Lifelines strategy and called for community members to participate. Oakland first tried Cease Fire effort was incompletely modeled after a program created in Boston in the late 1990s. That city’s Cease Fire evolved into a long-term partnership between city administrators, the police department, and black clergy who worked directly with gang members and offer alternatives to violence. Boston’s program put legal and social pressure on influential gang members. Other Cease Fire programs modeled on the Boston experience also take this carrot-and-hammer approach, making it clear that no further violent behavior will be tolerated. Boston succeeded in reducing juvenile shootings to zero for several months and Cease Fire programs in cities like Stockton and Chicago have show reductions in homicide rates of 30 to 44%. Cease Fire has worked, Kennedy explained, because it has focused on the small group of gang members most likely to engage in violence or to encourage others to engage in violence. These individuals often cause over half the incidents of gun violence in a neighborhood. Research on Cease Fire’s impact suggests that increased safety and order in a neighborhood encourages residents to follow legal and social norms and solve problems collectively. Critics and city officials alike say Oakland’s Cease Fire failed in 2009 because there was no coordination between city administrators, neighborhood organizations, and sate and federal law enforcement agencies. Another problem with the first effort was the lack of on-going support by community organizations to work closely with at-risk youth and returning offenders. For this latest effort, a broad coalition of clergy and Oakland churches is already active and taking to the streets. Oakland Police Sgt. Christopher Bolton said the new Cease Fire will fix some of those mistakes by involving “partnerships with the entire community.” Pastor McBride and Rev. Dixon are working closely with city officials to forge those relationships and get Oakland residents involved in Cease Fire-related programs. “We don’t believe you can do Cease Fire without getting everyone on board,” explained McBride. Bolton also called for collaborations between “criminal justice agencies, faith leaders, community organizers, youth and their advocates,” and other groups. Those alliances are critical in order “to span the often deep divisions among criminal justice agencies and the community,” Bolton explained. To ensure Cease Fire’s success this time around, Bolton said that the Mayor’s Office is “enhancing” its partnerships with several city, county, and federal agencies, including Highland Hospital, State Parole, and the U.S. Attorney’s office. Bolton said the city’s main partner is the NNSC, which is providing technical assistance and direction on implementing Cease Fire to the city through the California Partnership for Safe Communities. Oakland will fund the new Cease Fire program with a $2.2 million grant it received two years ago from the Department of Justice as part of the federal Community-Based Violence Prevention Demonstration – designed to offer cities several ways to reduce violence, including outreach and education, job training, and employment. With this money comes strong planning and administrative help from community non-violence advocacy groups, and from John Jay University. The federal grant calls for the City of Oakland and its partners to conduct call-ins – face-to-face meetings with 250 parolees and probationers with histories of gun violence. In September and October, there were on-going meetings with all participants in the Cease Fire coalition to hammer out working agreements. This is all led to a formal announcement in late October when the program finally started. While many people are happy to see Oakland launch a well-funded, more robust Cease Fire project, there are also reservations about how the community will be involved. Few people want to see an end to youth violence more than Kazu Haga, who has worked with Oakland youth. Haga, an Oakland-based Kingian Nonviolence trainer and co-founder of the Positive Peace Warrior Network , supports any effort to reduce violence . But he feels that ending gun violence in Oakland requires deeper and longer term efforts.